Monta was founded by the same creators of Everest Bands. If you are are unfamiliar with the brand Everest Bands, they are one of the leading aftermarket Rolex strap manufacturers. Naturally, there are Rolex inspired design elements found in their first offering, the Oceanking. 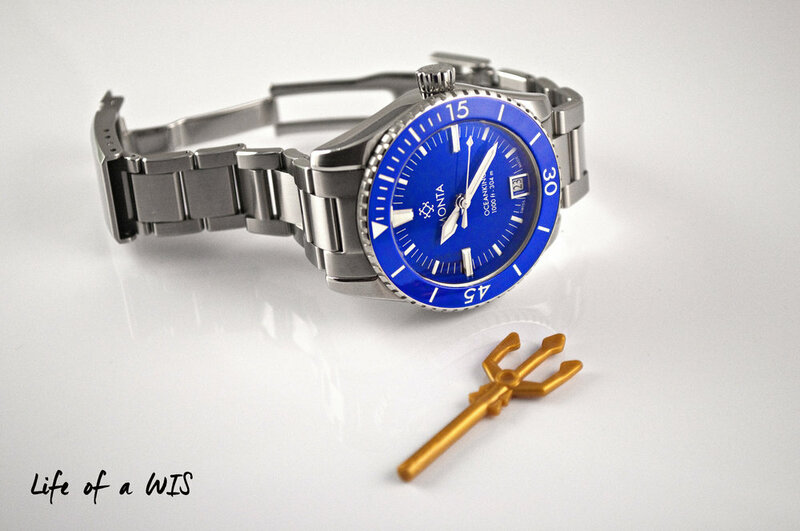 To the untrained eye and at first glance, the Oceanking vaguely resembles the Rolex Submariner. 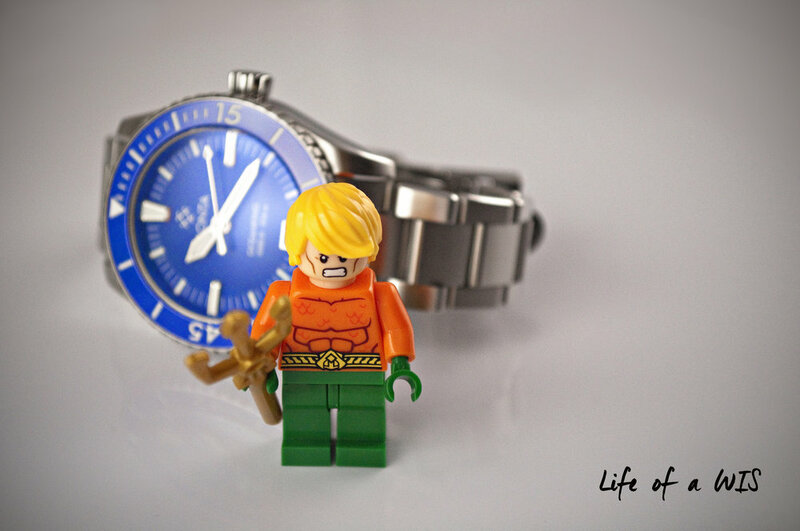 But once you stop to admire all the details, it becomes clear that the Oceanking is a serious watch in its own right. 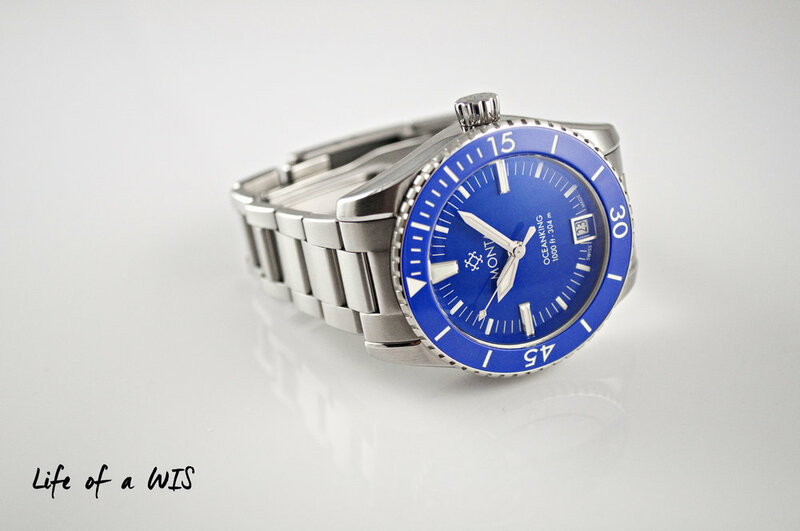 In the blue dial and blue bezel variant, the Oceanking is quite a stunning timepiece. Nonetheless, Monta played it safe with the Oceanking. Monta had the opportunity to design something completely different, something that could have set them apart from the myriads of brands out there… Ultimately, they decided to go the more conservative route when it came to the design and concept of their first model, which is good and bad. Good because the design is classic and should easily stand the test of time. Bad because nothing about the watch is innovative or unique. 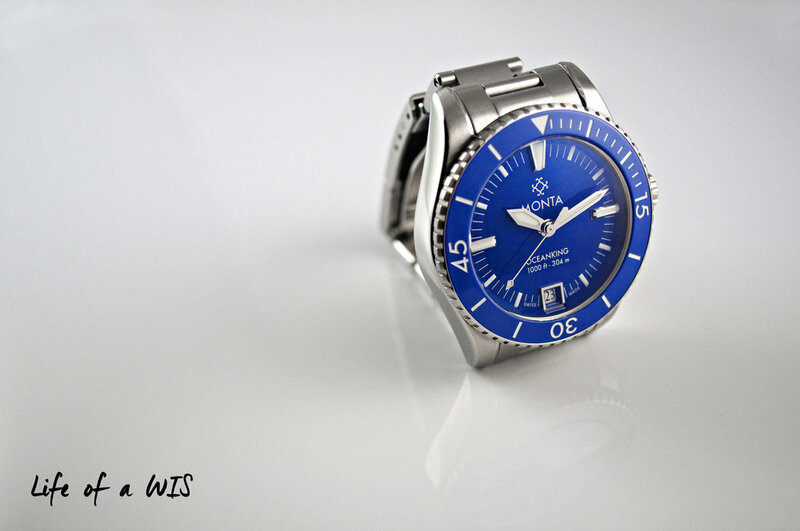 It is simply another attractive diver watch, albeit a well executed one. The 40mm case is made from 316L stainless steel and is beautifully finished. The sides are polished while the top and bottom of the lugs are brushed. Towards the inside of the lugs, there is a slight bump that is polished, creating an attractive contrast in finish. This nice detail is well incorporated into the bracelet as well (more on this later). For reference, the case on the Oceanking is slightly thicker than the case on the Rolex Submariner. The slightly double-domed sapphire crystal has a 7 layer anti-reflective coating on the inside, which seems to create a blue reflection from certain light sources. I am glad that they opted not to put an anti-reflective coating on the outside of the crystal since these coatings are easily scratched and are not cost effective to repair. The benefit of having reduced glare on the dial does not outweigh the detriment and distraction of having a scratched anti-reflective coating. Maybe it is the OCD in me talking, but scratched anti-reflective coatings give me severe heartburn. Having said that, despite the 7 layer anti-reflective coating on the inside, significant glare on the crystal remains. The solid screw-down caseback does not allow us to admire the Eterna movement inside, but it does come with some engravings to enhance its appearance. 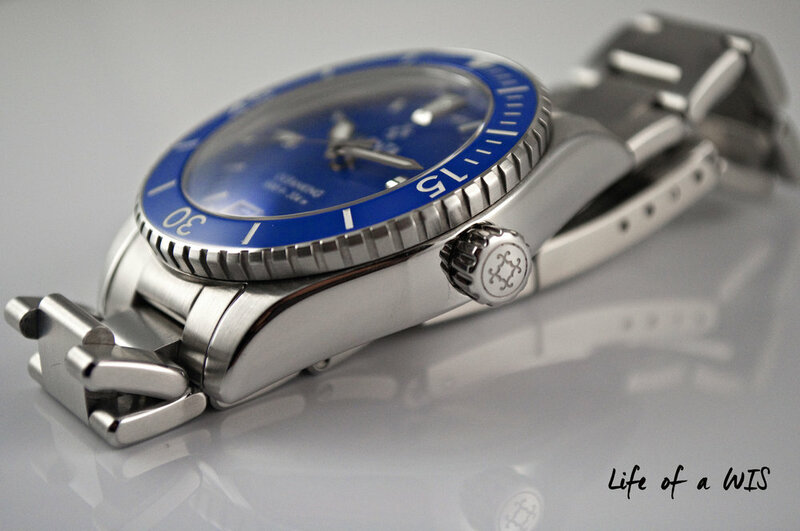 The 60-click bezel with ceramic insert is perfect for longevity and the blue matches the dial perfectly. The bezel is easy to use and it lines up with the minute marks precisely. 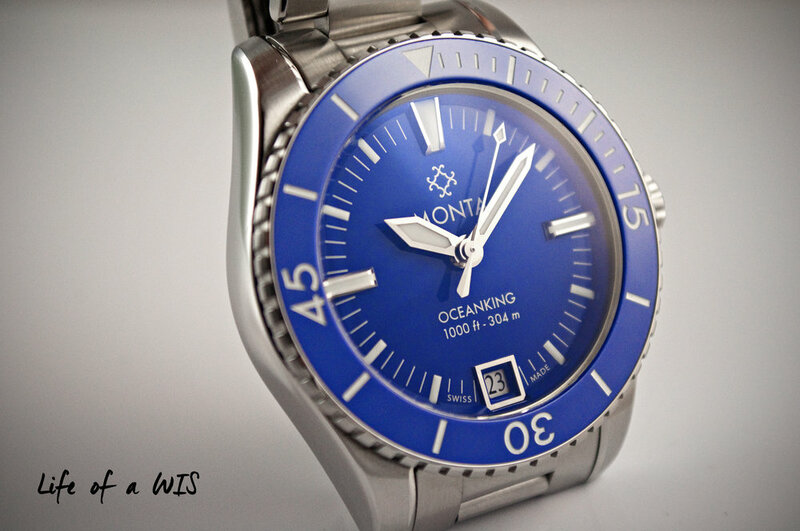 According to Monta, the Oceanking uses a unique pin and washer system that aligns all eight parts from the bezel assembly symmetrically, providing that perfect alignment. If you have ever owned a modern sport Rolex with a rotating bezel, you probably already know that an aligned bezel is quite a scarce commodity. The distinct oversized crown is free from any crown protectors and cleanly engraved with the Monta logo. The few polished surfaces give the Oceanking just the right amount of bling. The most striking part of this timepiece is the beautiful blue dial and blue bezel. The shade of blue chosen by Monta is simply perfection. The color is deep and bright without being obnoxious. The rhodium plated sword style hands have a flawless mirror finish. Simple, yet elegant. There are three polished applied indices at 12, 3, and 9 o’ clock. The other hour markers (with the exception of the 6 o’ clock one) and minute markers are painted. The hour indices and the hands are covered with LumiNova BG W9 color (a nice blue of course). At 6 o’ clock, the date window is cleanly incorporated into the design of the watch with a polished metal frame. All of these polished parts give the Oceanking just the right amount of bling. The right balance of applied indices and painted marks on the dial results in a very satisfying dial to stare at. The model name of the watch and its water depth rating is printed in white above the date window. Unlike Rolex, Monta is very precise on their metric conversion. Monta correctly states that their 1,000 feet depth rating is equivalent to 304 meters (more like 304.8 meters, but 304 meters is close enough)… not 300 meters like Rolex prints on their Submariners. At the top of the dial, the brand Monta and their logo is proudly printed in white as well. The shade of blue is simply stunning! 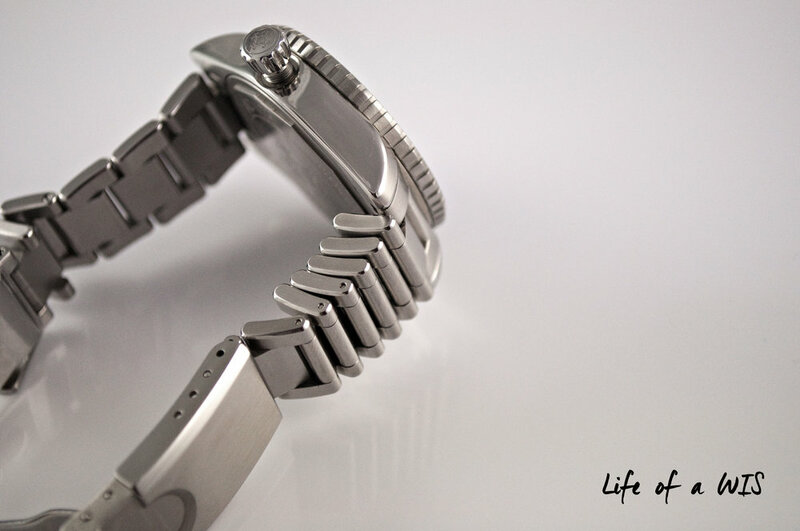 The mostly brushed solid stainless steel bracelet is fully articulating, which makes it extremely comfortable. To match the design of the case, all links have a polished beveled edge. Thank you Monta for using screws in the link system (similar to Rolex bracelets) and for using decent sized screws too! This makes removing links exceptionally easy… hands down the best type of link system. I wish all manufacturers would stop being so cheap and adopt this screw based link system on all their bracelets. The bracelet also features a safety clasp with an engraved Monta logo. Like the rest of the watch, the clasp is mainly brushed with a few polished surfaces. Beautiful, but not as sophisticated as a Rolex clasp. Finally, the clasp also has 4 micro adjustments holes for that ultimate fit. Not your typical micro brand bracelet. Powering the Oceanking is the Swiss manufactured Eterna Caliber 3909A with a 65-hour power reserve and a quick date adjust feature. This is a mechanical self-winding movement with 29 jewels. Time keeping was spot on during the duration of the review. The screw down case back prevents us from admiring the Eterna movement inside. Legibility on the Oceanking is excellent, both day and night. The sword style hands are easy to distinguish and the dial is clutter free. Furthermore, the date window is positioned at 6 o’ clock, which is probably the cleanest place for it. The Swiss LumiNova on the hands and the hour indices shine brightly in the dark, allowing the user to tell time even when there is no light source… just do not expect to be able to use the bezel in the dark, as there is no lume anywhere on the bezel. Easy to read, day or night. The 60-click bezel with ceramic insert is firm, but easy to operate. The oversized crown is very accessible due to the lack of crown guards. In addition, the design and shape of the crown makes it easy to pull out and turn to adjust the time or date. Both the bezel and crown are easy to operate. The Oceanking features a 40mm 316L stainless case, breathtaking blue dial, double-domed sapphire crystal with 7 layers of anti-reflective coating on the inside, Eterna movement with 65-hours of power reserve, 304 meters of water resistance, date function, 60-click ceramic bezel for timing, and a fully articulating stainless steel bracelet. Everest Bands straps will fit your Oceanking perfectly, giving it a completely different look. A lot of effort has been put into the design and quality of this bracelet. After wearing the Oceanking for three straight weeks, there is no question that it is one of the most comfortable watches I have ever worn. The articulating feature on the bracelet allows the bracelet to contour to your wrist. In addition, the clasp design ensures that there are no unnecessary surfaces pressing against your wrist that could cause discomfort (such as side buttons which are typical on a butterfly clasp). One of the most comfortable bracelets I have ever worn. 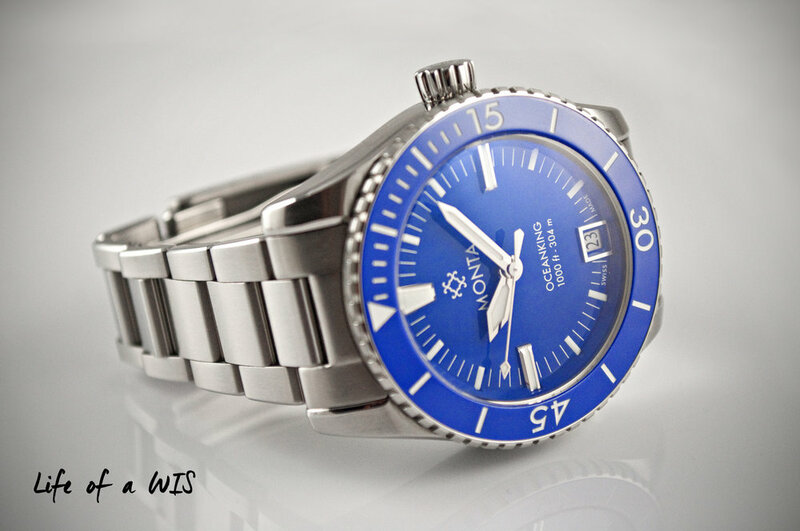 The retail price for the Oceanking on the stainless steel bracelet is $2,350. Despite its recent price reduction, that is still a lot to swallow… especially for a brand new brand and its first offering. The quality on this timepiece is top-notch. If value was based solely on how much you paid versus the quality of the watch, then the Oceanking would have scored a lot higher. When determining the scoring for value, there are other factors that must be considered such as the prestige of the brand name and even resell value (which is typically closely related to the power of the brand name). At this price range, you could be getting yourself a Tudor Heritage in the grey market or an Oris Diver at retail. But how many people will you find in the wild wearing a Monta? With the blue version of the Oceanking being limited to only 15 pieces, those chances are slim to none. And that my friend, is hard to put a value on. Rumor has it that there are only 2 more pieces left of the blue version, so if you want a blue one you better jump on it now. A fantastic first offering from a brand new watch company that understands quality and timeless designs.